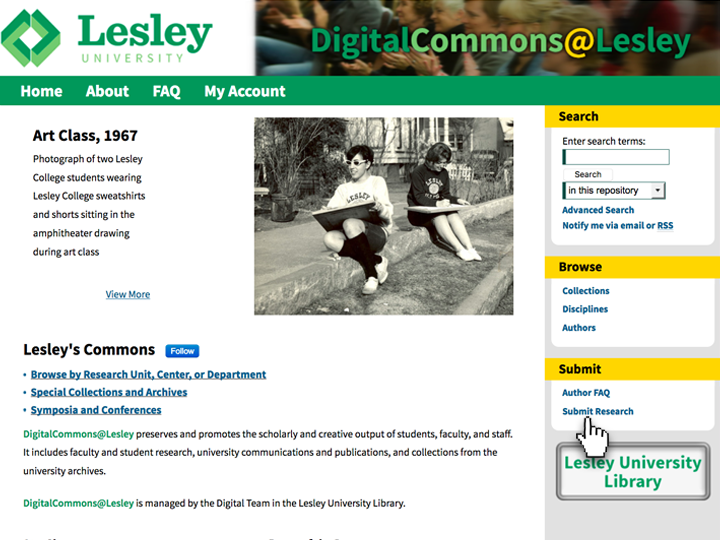 Go to DigitalCommons@Lesley and click on "Submit Research" to begin the submission process. Choose the type of work you plan to submit (ex. CLAS Senior Thesis). 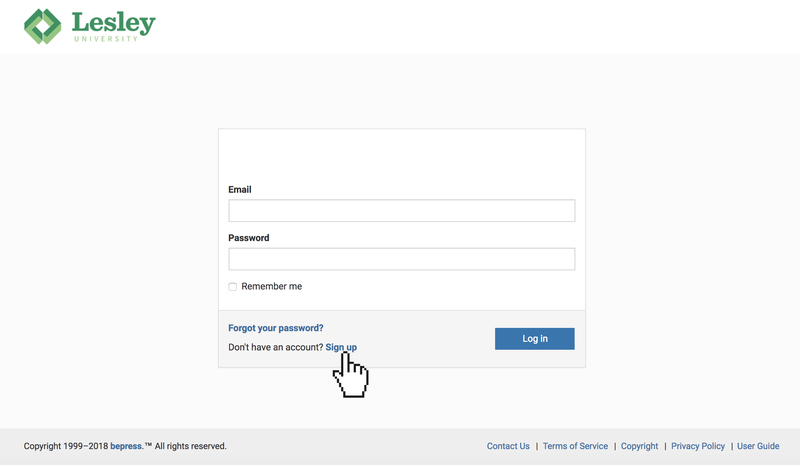 Create a new account, unless you already have a Digital Commons login. Enter your personal information and password—make sure you have access to the email account you use to signup. Then retrieve and click on the link in the email. You will then be directed to a submission agreement form. Read it carefully and then click that you agree to submit your work. You will then be prompted to fill out a submission form that includes the title of your portfolio/capstone/thesis/dissertation, your adviser(s), the abstract, keywords, subject categories, creative commons licensing, and supplemental materials (if applicable). 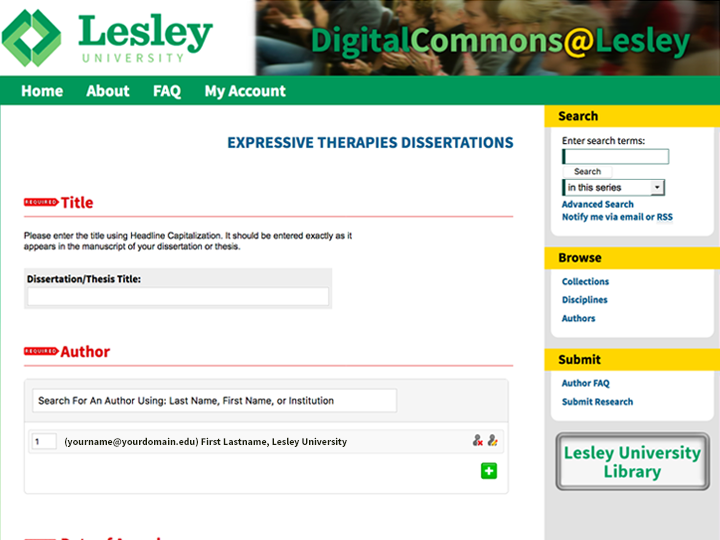 Go to DigitalCommons@Lesley and click on "Submit Research" to begin the process of submiting your thesis or dissertation. Pick what type of work you plan to submit. 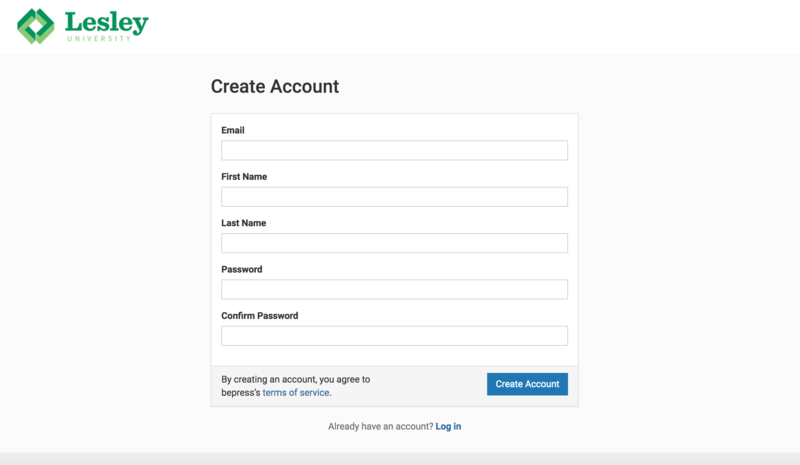 On the "My Account" page, you will create a new account, unless you already have a Digital Commons login. Enter your personal information and password—make sure you have access to the email account you use to signup. After you click "Sign Up," you will receive an email with a link to confirm your registration. The link in your email will direct you to a submission agreement form. Read it carefully and then click that you agree to submit your work. Fill out the form that describes your portfolio/capstone/thesis/dissertation to potential readers. 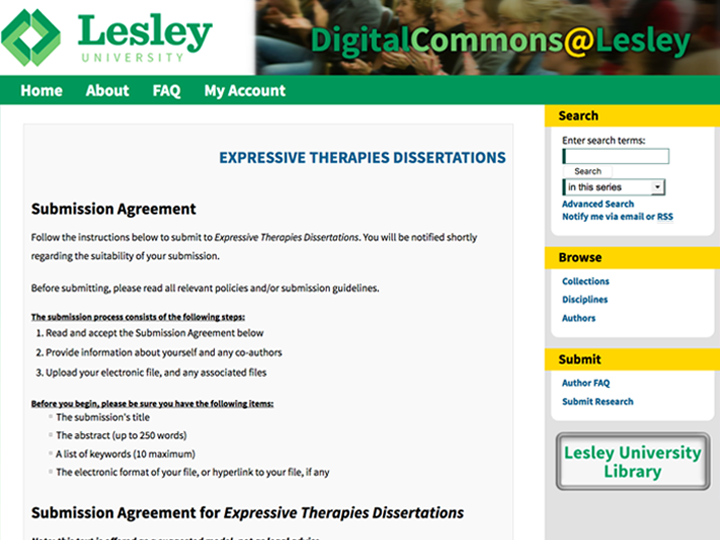 Include the title, your advisor(s), the abstract, keywords, etc. Imagine you are trying to find your work and think of keywords that you would use to find it. 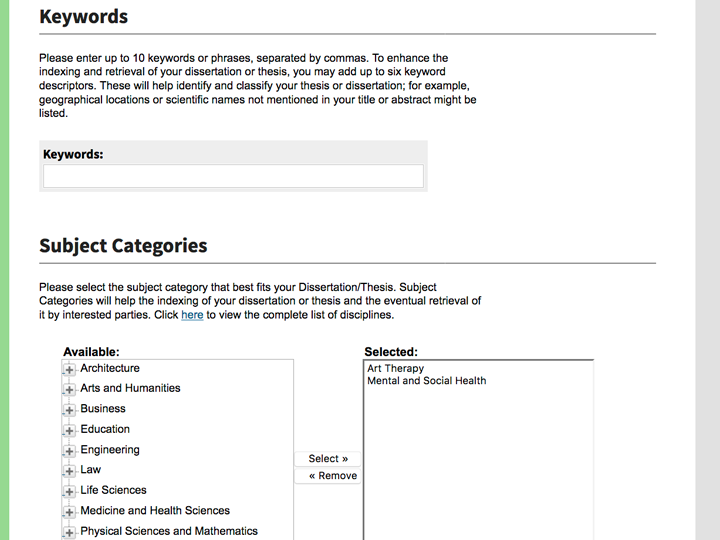 Then pick appropriate subject categories and sub-categories to choose the commons your paper will appear in (ex. Art Therapy Commons). 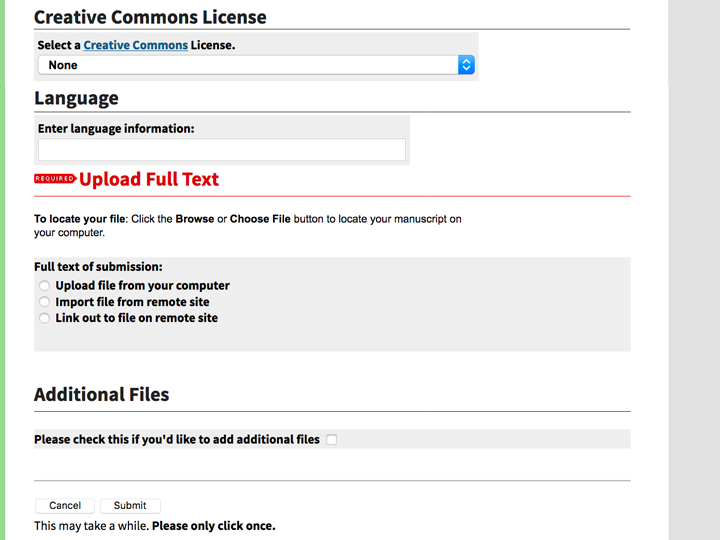 Include a Creative Commons License (learn more here) to instruct readers what they can and cannot do with your work. If you need to upload additional files (ex. images, datasets, video, etc. ), make sure you click the box to add additional files before submitting your paper. This will lead you to another page to upload additional files. 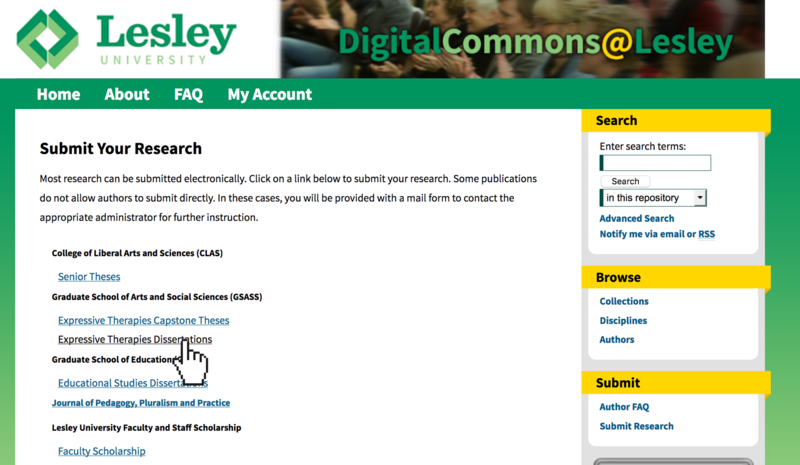 Further questions should be directed to the Digital Scholarship Librarian at digitalcommons@lesley.edu.